Investor qualification. What is it and why is it done? As we covered in previous posts in this series, trading in security tokens is strictly controlled by laws and regulations designed to prevent money laundering, funneling funds to illegal activities, and to protect less sophisticated investors from being victims of unscrupulous solicitation of funds. These laws and regulations, which vary across jurisdictions, stipulate that investors in securities must be qualified to trade. Obtaining a qualified investor status requires an individual to perform a number of verifications of their personal data. Verifications bridge the gap of anonymity by allowing businesses to have greater information about the identity of their clients and to make informed judgements about the plausibility of the source of their clients’ funds. In some jurisdictions, where investing in securities is limited to sophisticated investors only, a separate verification proving this status is also required. Verifications are usually performed by entities we call Verification Service Providers (VSP). Know-Your-Customer (KYC) — Establishes an individual’s identity. Anti-Money Laundering (AML) — Ensuring funds are not sourced from or used to finance illegal activity. Sophisticated Investor (Accredited) — Restricting investing to those who meet certain income or asset thresholds as defined in their jurisdiction. A check is simply a confirmation that a piece of personal data provided by an individual can be verified by some officially issued, authorized and recognized document or credential. For the purposes of investing in security tokens, your name can be confirmed by your passport or driver’s license, your address and source of funds can be confirmed by a bank statement, and your status as a sophisticated investor can be confirmed by your tax return or a letter from your accountant. In and of itself, a single verification may not establish that you’re not a criminal or that you obtained your funds from legitimate sources. A set of verifications, however, considered in totality, results in obtaining a qualification. 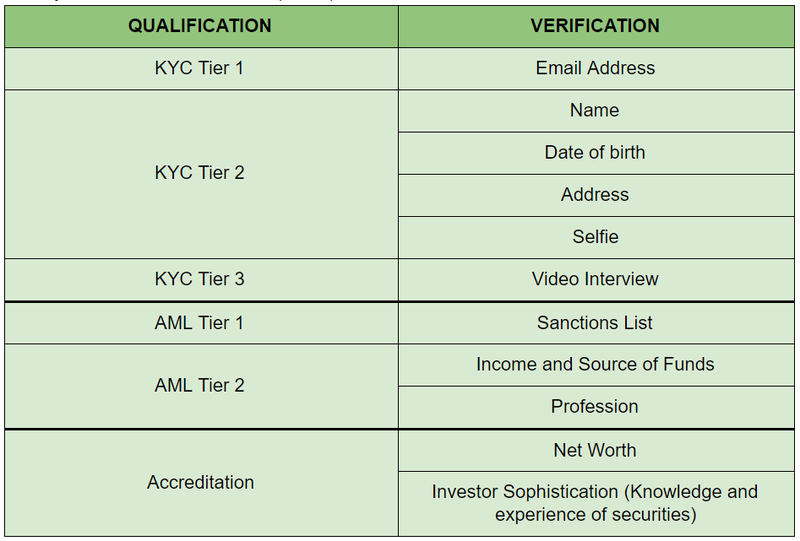 The sets of verifications required to obtain a qualification differs according to jurisdiction and are advised by legal counsel to the token issuer. How are qualifications derived and what are qualification tiers? As described above, qualifications are derived by completing sets of verification checks, and may be tiered. A basic tier may allow trading, deposit and withdrawal only of cryptocurrencies. Higher tiers require a greater level of due diligence and risk assessment, and permit investors to access advanced features and obtain higher limits. These may include the ability to deposit and withdraw fiat funds directly to a bank account. 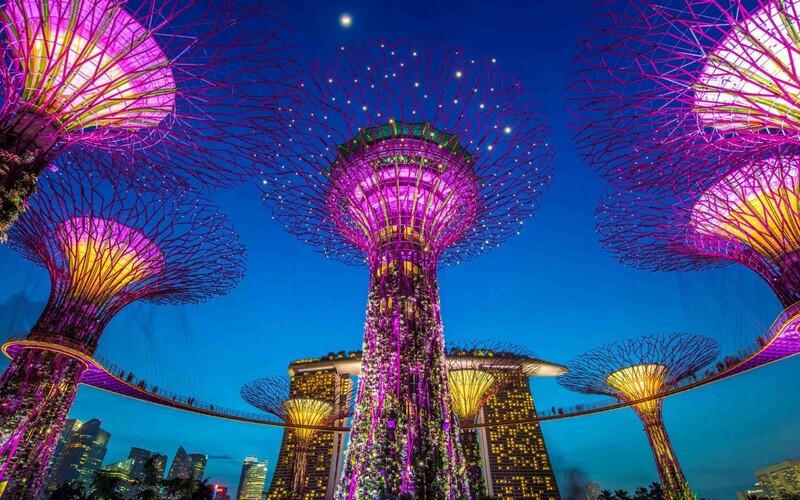 Adoption and liquidity of security tokens relies on the ease with which token issuers and exchanges can qualify investors. The challenges in the current environment originate from differences in compliance requirements across jurisdictions, a lack of understanding of qualifications by unsophisticated investors, and the technical and logistical issues that create friction in this process. Some of these have been discussed in our previous posts, but let’s outline a few here. Each jurisdiction has its own set of laws governing security token compliance. A security token offering must abide by the laws of the jurisdiction where the offering takes place and where the investor resides. Exchanges also have to abide by the laws where their servers are located and where trading actually takes place. Difficult to compare verification service providers due to the absence of a uniform marketplace and transparency in costs. Technical standards for third party integration don’t exist. There is no Interoperability. Qualifications live in silos and are not reusable. Verification checks are inefficient, having to be done for every investment. There is no real standard for qualification types. MAP recommends a qualification standard which simplifies the process for new qualification and verification service providers trying to get into the space. So how does MAP provide solutions to the challenges above? Qualifying an investor begins with a token issuer defining the VSPs that are permitted to perform verification checks for a specific token in each applicable jurisdiction. Investors looking to obtain a qualification for this token discover these VSPs and the costs associated with their services. They then send a request with the necessary personal data to a selected VSPs for verification. The functions performed by VSPs are quite straight forward. Fundamentally, VSPs serve to verify the authenticity of personal data or credentials claimed by an individual. By comparing user-provided data with verified documentation, VSPs certify the accuracy and legitimacy of personal data such as name, date of birth, country of residence, address, and if required for investor accreditation purposes, income and asset assessments. A permissioned VSP can be virtually any entity, as long as it contributes its data and processes to a visible audit trail, which is automatically captured by MAP through its protocol. To give an example, a token issuer could also be a VSP if it provides a whitelist of qualified wallet addresses that it has vetted on its own. It is important to understand that VSPs do not actually qualify an investor. For the most part, they are agnostic to the regulatory requirements an investor needs to meet, but simply perform the individual verification checks that an external observer requires to assess an investor’s qualification. Once the verification checks have been performed, any qualification provider can reference them as proofs and qualify the investor as being compliant to trade the specific security token. At this point, the qualification and a wallet are associated. Note that this association occurs without exposing any personal data of the investor. The qualified investor is now in possession of a plug-and-trade-enabled wallet that has just gained some incredible superpowers! Portable: It can prove its compliance on other platforms. Shielded: It maintains the privacy of the owner’s identity. Enhanceable: It acquires multiple qualifications. Interchangeable: It can import and share its compliance to other wallets. The Swarm Organisation is the first qualification provider that supports MAP. It qualifies wallets based on verifications performed by our partner IDMind, and in future will easily integrate other VSPs like Netverify and Civic. Every account created on the Swarm platform contains a MAP wallet, and any investors that have completed KYC via Swarm are already compliant to trade security tokens anywhere that supports MAP, now and into the future. Consider your Swarm wallet supercharged. As future methods of identity verification are developed, for example, human-to-human verification, or leveraging social network presence, these can simply be plugged into MAP. Token issuers offering tokenized investments on Swarm are already taking full advantage of the benefits of MAP, accessing a pool of pre-qualified investors without having to bear the cost of the qualifications. Exchanges that are integrated with MAP will support these tokens automatically, offering out-of-the-box liquidity. In summary, the rise and availability of security tokens as investments is a revolutionary concept that has many opportunities and also consequences for how traditional finance has functioned for decades. We don’t know all the possibilities and advancements that this new way of managing the world’s assets will bring, but we do know that to get there, it is important that advances in this field adhere to, comply with and respect the regulatory environment as it develops. Securities are strictly controlled by laws and regulations designed to protect investors, requiring them to undergo various verifications of their personal data to obtain a qualification or permission to invest. The friction in this process is key to the rate of adoption of security tokens as viable investments. Swarm is delivering an elegant solution to these hurdles by offering a portable, privacy respecting standard that can qualify investors easily and more efficiently than is currently possible. Onboarding new service providers and their investor pools onto MAP is simple, and individuals can conveniently import existing qualifications from other platforms and services. MAP vindicates the inconvenience we’ve all been through to undergo identity verification on other platforms, transforming the process of becoming qualified from a burden to a badge. MAP-compliant wallets are already available via the Swarm platform to anyone wishing to become qualified to own and trade security tokens. We’d love for you to get your supercharged security token compliant wallet today, and we’ll even reward you 10 SWM tokens for doing so.